Oh look, a Michigan man had a 500 horsepower Viper V10 installed in a 1930 Rolls-Royce. I think I just found my new dream car. You see, I love classic cars from before WWII, but I don’t want to put up with their ancient, slow, unreliable engines. Swapping in just about any modern drivetrain would likely solve that problem, which is what makes this resto-mod great. It goes over the top in the most wonderful, American tradition. 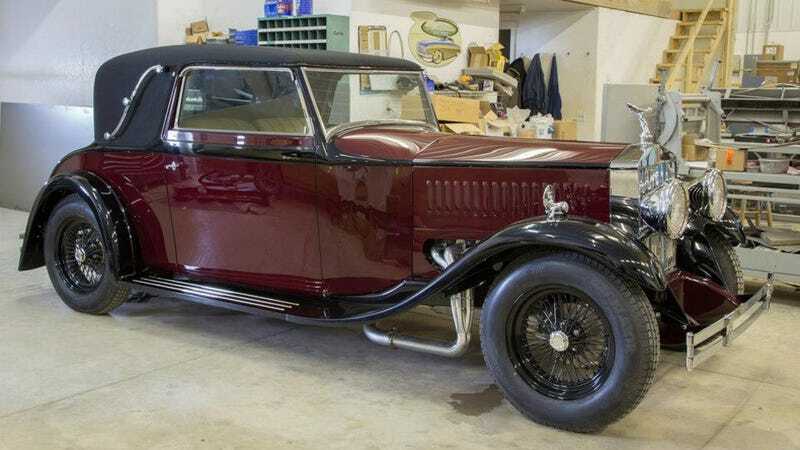 A West Michigan shop recently revealed that they have wired a 2004 Dodge Viper powertrain into a two-door 1930 Rolls-Royce, fitted with some custom chassis work as well. Their post on Viper Club’s forum explains the build. The car is a full restoration with many custom pieces built on a tube frame chassis, and uses a 2004 Viper powertrain. This car was built to be a driver, and all of the problematic original parts have been redesigned or replaced. More or less, it is an original body and design mixed with a new-tech chassis and drivetrain. This car even has heat, A/C, and all of the bells and whistles that go along with professional motorsports electronics. As Jeff Glucker of Hooniverse noted, I don’t mind that this thing isn’t being set up as a powerslide-prepped doriftomoble or as a rally car. I’m stunned as it is just to see a frankly gorgeous classic car brought up to and past the standards of modern performance. Plus, even set up as a highway cruiser, I have no doubt the 8.3 liters of engine can incinerate those vintage-sized tires with ease. I can’t wait for its unveiling at the Detroit Autorama in March. For now, join me as I glean every piece of information I can out of its Viper Club forum thread and drool over all the extra pictures there.